These pontoon boat seats make up our Classic CRG85 pontoon furniture set. What is the height & wieght of the CRG83? 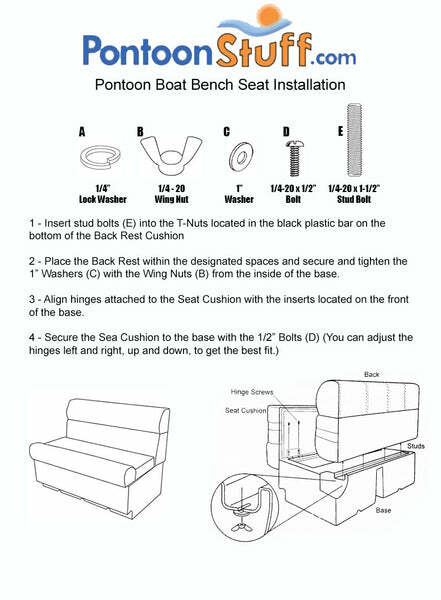 This pontoon furniture group wieghs 156 lbs. The total height of the pontoon replacemetn seats are 29 1/2 inches. The height to the top of the pontoon seat cushion is about 17 inches. What are the measurements of this bench seats? length is 84, what is depth of it? For this pontoon furniture set the corner seats are 28" deep and the middle bench is 24.5" deep overall. Thank you for the opportunity! The corners are 28’’ do they make a 34’’ seat to go in between two 28’’ seats to make 90’’? We currently do not make a 34" pontoon seat. For 90" you have a few options to get the most seating as possible out of your new pontoon seats. Many customers will use a pontoon 28" corner seat, a 38" pontoon bench seat and a 7" arm rest to give them 90" Inches. Can I order just the tops without the plastic bases? No, we do not offer the cushions without the plastic bases. Yes, you can arrange these seats however you would like. You will just need to purchase them separately. what is the width of the corner seats? These pontoon boat seats are 28" x 28"
Do the corner seats have storage beneath them and what is the radius of the rear corner? Yes Pontoon Seats have storage inside of them. The radius of the corner seats are 8".